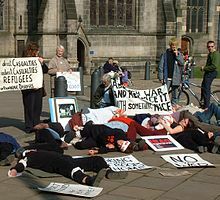 Die-in protest against 2003 invasion of Iraq in Sheffield, United Kingdom. A die-in, sometimes known as a lie-in, is a form of protest in which participants simulate being dead. Die-ins are actions that have been used by a variety of protest groups on topics such as animal rights, anti-war, human rights, AIDS, gun control, and environmental issues. Often, protestors occupy an area for a short time instead of being forced to leave by the police. In the simplest form of a die-in, protesters simply lie down on the ground and pretend to be dead, sometimes covering themselves with signs or banners. The point of a die-in is to disrupt the flow of people on a street or sidewalk to grab the attention of passersby. In more complex forms, fake blood or blood-stained bandages are sometimes used, as well as simulated death throes and writhing from the protesters in an attempt to make the deaths appear more realistic. In other cases, protesters have surrounded the "bodies" in chalk outlines reminiscent of the troped outlines around murder victims. This has been done as an attempt to symbolize that the organization being protested against has "murdered" people. Sometimes, part of the protesting group makes speeches about what is being protested while the rest of the group lies on the ground. On 22 April 2006, thousands of protesters lay in the Francisco de Miranda avenue in Caracas, Venezuela, to protest against crime and insecurity during Hugo Chávez's government in a protest by Movimiento Estudiantil called "Acuéstate por la vida" (Lie Down for Life). On September 15, 2007, several thousand protested the Iraq war at the Capitol at Washington D.C. Hundreds "sprawled on the ground" on the Capitol lawn at the die-in. Over 190 were arrested, including ten veterans of the Iraq war. In Israel in November 2018, a few feminist protestors lay in blood for awareness for women murders in front of the Kneset in Jerusalem. On December 15, 2018, more than 100 members of the Cambridge division of the international social movement Extinction Rebellion staged a die-in in the Cambridge city centre, to call upon the official county and city authority declaration of a climate emergency. Wikimedia Commons has media related to Die-in. ^ Donatella Della Porta; Abby Peterson; Herbert Reiter (2006). The Policing of Transnational Protest. Ashgate Publishing. p. 92. ISBN 978-0-7546-2676-3. ^ a b Thomas Vernon Reed (2005). The Art Of Protest: Culture And Activism From The Civil Rights Movement To The Streets Of Seattle. U of Minnesota Press. p. 195. ISBN 978-0-8166-3770-6. ^ Washingtion, Jesse. "In gun debate, two sides speak different languages". Associated Press. Retrieved 16 January 2013. ^ a b Sharon J. Smith (22 February 2011). The Young Activist's Guide to Building a Green Movement and Changing the World. Random House. p. 117. ISBN 978-1-60774-016-2. ^ a b Mark Andersen; Mark Jenkins (2003). Dance of Days: Two Decades of Punk in the Nation's Capital. Akashic Books. p. 170. ISBN 978-1-888451-44-3. ^ ""Acuéstate por la vida"... y se acostaron" (in Spanish). La República. Retrieved 3 January 2018. ^ "Chants and applause as more than 100 protesters stage march and die-in in Cambridge's city centre". Cambridgeshire Live. December 15, 2018. Retrieved December 15, 2018.